An average set of tires can cost anywhere from $300 to $500. That’s a lot of money. Want to get more miles out of your tires? Check out the tips below so that you can achieve extended tire life. Studies have shown that up to 70% of vehicles on the road have at least one under-inflated tire. Checking and maintaining tire pressure regularly will help extend tire life and reduce fuel consumption. Every time you check your Toyota’s tire pressures, you should also examine the tires for damage, foreign objects, and wear. 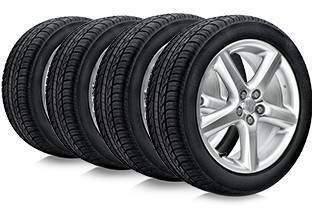 Misaligned wheels can cause uneven and rapid tire wear. It is normal for wheel alignment to change through the life of the vehicle as wear accumulates and especially if the vehicle is driven on rough roads. If abnormal tire wear or damage is discovered when checking tire pressures or during vehicle maintenance, or your Toyota has developed symptoms such as pulling to one side or that the steering wheel is not centred when driving straight, the wheel alignment should be checked and corrected if needed. Some tires use a soft adhesive compound that helps with handling, but wears down quicker than other types of tires. When talking with a mechanic, check to make sure that you purchase a set of tires with harder rubber. If you want to extend the life of your tires, you need to rotate your tires. Your front and back tires wear differently. By rotating them, you help to extend the life of your tires. Speed affects tire wear. That’s one of the many reasons racing teams burn through so many tires during a race. Stick to the posted speed limits, and you’ll get more out of your tires.